PHP is an open source language, but it lacked good development tools for many years. The majority of PHP programmers used free editors to write code. Zend created a full featured PHP development tool (Zend Studio) but it carried a hefty price tag, which many programmers were unwilling to pay. So, most just used the free editors they already had. There are expensive options for PHP development environments, i.e. Zend Studio, Delphi for PHP, but there is also an extension for Eclipse which can be used for PHP programming. The PDT Project is a development tools framework with features comparable to its commercial counterparts. The PDT Project can be installed as a Eclipse extension, or as a complete Eclipse application with PDT setup. You can download it at the PDT Project page. The software doesn’t get installed, you just extract the contents, move the eclipse folder to where you want it, and then run eclipse.exe (create a short-cut for your desktop). After running eclipse, you should download the Remote System Explorer tools so that you can connect to web sites by FTP and SSH. The easiest way to install this is through the Software Updates option on the Help menu, and then go the available software tab. Search for the word remote and the options in the screen below will be displayed. Check the options as below and press the Install button. 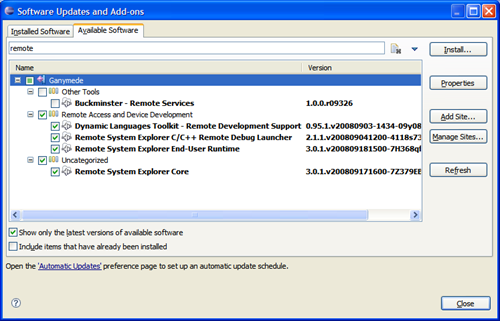 The remote tools will then be installed. Once all of this is installed, your ready for PHP development.